A delicious and sharply funny page-turner about "innocent" Americans abroad in 1950s Siena, Italy. Newly married, Scottie and Michael are seduced by Tuscany's famous beauty. But the secrets they are keeping from each other force them beneath the splendid surface to a more complex view of ltaly, America and each other. When Scottie's Italian teacher--a teenager with secrets of his own--disappears, her search for him leads her to discover other, darker truths about herself, her husband and her country. Michael's dedication to saving the world from communism crumbles as he begins to see that he is a pawn in a much different game. Driven apart by lies, Michael and Scottie must find their way through a maze of history, memory, hate and love to a new kind of complicated truth. 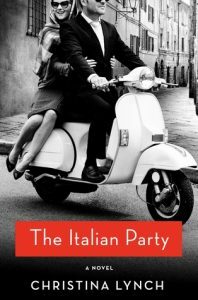 Half glamorous fun, half an examination of America's role in the world, and filled with sun-dappled pasta lunches, prosecco, charming spies and horse racing, The Italian Party is a smart pleasure. As soon as I began reading The Italian Party, I was swept away to post-WWII Italy and enveloped in a domestic spy thriller that captivated me from the first page to the final sentence. Scottie and Michael are newlyweds moving to Siena, Italy, to start their new lives as husband and wife. Michael’s been sent to Italy to sell the Italians some American tractors to propel Italy to more “modern” industrialization, or so Scottie thinks. Scottie appears to be the perfect person to fulfill Michael’s want and need for a wife, or so Michael thinks. 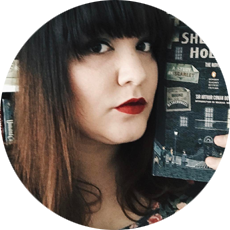 Each of them have secrets upon secrets of their own, and the book deftly explores and unravels these secrets as the story progresses. Michael has been sent to Italy with orders from the CIA to stop the Communist candidate from winning an election. His Ford office in Siena is merely a cover for his actual work. Without spoiling too much of the novel itself, Lynch explores one facet of the post-WWII/Cold War fears of the rise of communism and the fears from America about that rise. Little struggles throughout the book, including the “favored” American dessert of a can of peaches topped with whipped cream and a maraschino cherry over delicious Italian gelato, showcased the “rightness” and “righteousness” of American idealism over anything else. The Italian Party is probably going to end up on my favorites of the year list. I loved the secrets weaving themselves through Scottie and Michael’s marriage and life outside their marriage. I love the development of the characters from beginning to end, and I love how both of them choose to support each other after all of these secrets between them come to the surface. The 1950s were mostly a different time and place compared to now, but Lynch shows that even then, people struggled with and faced the same difficulties in a relationship that people do today. So much of this novel reflects the current time, and it’s eye-opening to see history begin to repeat itself. Christina Lynch weaves in domestic life with a spy thriller incredibly well, and the pacing of the book was excellent. I loved how the chapters themselves were divided into small sections, and somehow that made it even easier to zip right through and enjoy this book. Lynch’s sparkling prose makes you feel as if you are a fly on the wall in Scottie and Michael’s life in Italy, and it’s the perfect spring escape. Many thanks to St. Martin’s Press for sending me a free copy to review; all opinions are my own!